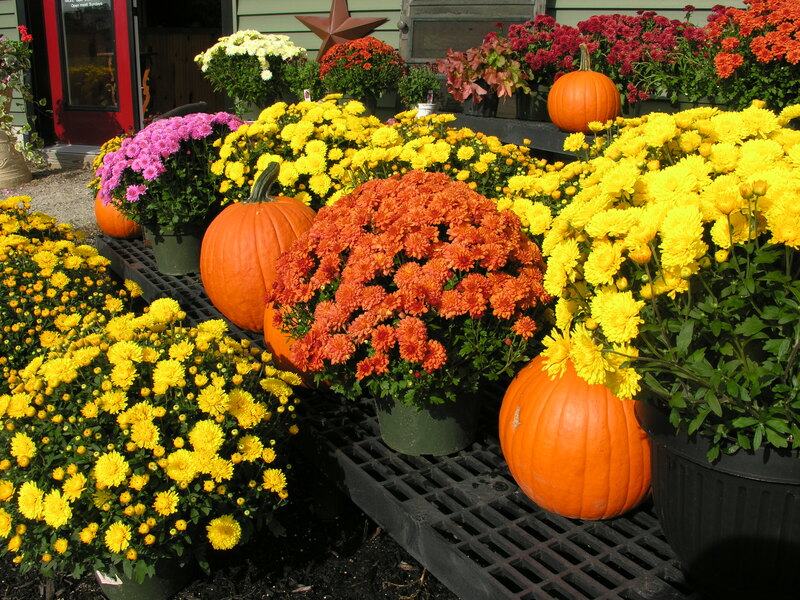 It’s a sure bet that as soon as the kids head back to school, chrysanthemums – hundreds of them – will begin to appear in a nursery or market near you. I am not sure if this is a tradition that is particular to New England, and I would love to hear from readers in other parts of the country – and other countries, for that matter. Does everybody buy these in the fall? It sure seems like they do around here. For years, I have followed the crowds to the chrysanthemum displays, bleating in submission as I try to pick plants with colors that I can live with. Why are the colors so muddy? And why is there never any soil in the pots? I bring my purchases home and quickly find out that because the growers always skimp on soil, the pots are light even after having been diligently watered, so they blow over in the slightest breeze. Then, as autumn becomes rainy, as it inevitably does around these parts, the flowers begin turning to brown mush. The final phase before they are tossed is crispy, brown, wilted foliage, jutting from an overturned plastic pot. This scenario repeats itself over and over every year, and until this year, I was a part of it, too. But this year, I am saying a resounding NO to overpriced plants that only last a few short weeks and are just plain unsustainable. I will not succumb to the mum! They are always tempting and I’m almost always disappointed if I leave them in their pots, dirtynailz. They arrived here in middle Georgia about two weeks ago, but the prices are not expensive here. They’re better if I put them into my own pots and I’ve successfully transplanted some of them into my garden. They usually bloom late spring and then again in the autumn. I have some in bloom now that I transplanted last year. They don’t compare with real garden mums, though. We also get some varieties with several colors on each petal. Maybe they’re not real mums. I enjoy the pansies, snapdragons, and dianthus planted with lettuce more than the mums for this season, though. And you can eat all of them after they get past that nursery phase. I keep them organic. The ones we buy this time of year won’t survive the winter, and I don’t think they’re meant to. You have a point about transplanting them into proper pots with actual soil. That definitely prolongs the life of the plants. The only two mums I have been able to keep (and they are planted in pots!) are a deep double red one and a single white. They seem to come back year after year, and I don’t do anything for them except to pinch them heavily between spring and July 1. They bloom heavily every year, and I just put my spring/summer selections around them. well, you are lucky, I guess. I have had a couple that hung in for a year or two, but that was about it. Well, I’m not “mum” as you know when it comes to speaking :), but Halloween is my favorite holiday and I can never resist the images of pumpkins, mums, hay bales, scarecrows and the (artificial) bittersweet wreath on the door! It just seems like something I have always done and always signals fall to me. I know, they’re hard to resist. Do what makes you happy, K! I am determined to resist this year, though….